Sanskrit audio pronunciation of Hatha Yoga Pradipika IV.1 provided by Manorama. My computer talks to me and I talk to her. Her name is Siri and she uses mostly written language to communicate with me. She has a limited vocabulary – she doesn’t seem to know any Sanskrit or yoga terms! There is something else missing from her responses. When she responds to me, there always seems to be a need to ask, “But, what do you mean?” Siri’s words are always flat and unaffected. That will change someday. The level of communication now, is more like hitting a switch than creating understanding, but someday the computer might really begin to talk. The inflection or intonation of a word can reveal its true meaning. The large vocabulary of sounds that we make and how we make them carries a deeper level of meaning than words alone, revealing the meaning of a spoken phrase and the underlying intention. Sounds, like the click of the tongue, a hiss of breath, or vocalism communicate more than words alone and include a myriad of emotional, intentional, rhetorical, or emphatic subtleties. Phoneticists, investigating the way mothers in various cultures communicate with sounds to their pre-verbal infants, found similar sounds used and recognized throughout the world. For all of us, our earliest experience of communication was through pure sound, stripped of any written language component or cultural junk, and filled with meaning. That pre-verbal vocabulary is alive and well – deeply imbedded in our speech. All spoken language predates the written form of language. The written version of any language is a distillation of a much larger landscape of clicks, breaths, tonalities, utterances, expressions and gestures. In the distillation to a written form our huge vocabulary is reduced to a mere fraction of it’s total. The primal language of sounds lives on in our spoken traditions, and we can benefit enormously from studying the underlying subtle content of our own words. Nada Yoga is the yoga of sound and vibration. The world is made of sound, Nada Brahma, or the infinite vibrations of the one primal sound. The Sanskrit language organizes essential sound vibrations into a feel-able universe of direct experience of the subtle nature of existence. Sanskrit expresses the sound nature of a feeling or thing directly. The purpose for imbedding the sound essence of feelings and things into the language is so that we could experience it directly and often, and know the dimension of ourselves that is the same essence. Fortunately we can’t go wrong with the names of God. We are well practiced in the pronunciation of the various Sanskrit names of God, and we are expert at filling words with emotions of a universal language. We say “names” of God, but the Sanskrit sound is God, (not just the name of God.) When we conduct the sound – that is God, there is only one way to do it – by shaping the instrument, your body, in a specific way. Placing the tongue just so, and the lips at the correct attitude, giving the sound an upward direction, this is the asana of mantra. Repetition is important – as we resonate with the sound and hold that resonation, the form of God is experienced persistently. The form is the sound, and through the sound we experience the oneness of sound and form. We no longer have to rely on a description of God, we can experience directly. The devotee calls out for God with subtle emotion and it is the emotional content of the sound that propels it to the Lord. We are all expert at emotions and we know how to call out to God with the full range of emotional possibilities. When your bodily awareness drops away and the pure sound remains, there is no longer a sound and a maker of sound – there is just sound. Sound is God! Review the correct pronunciation of a name of god, for example Krishna. 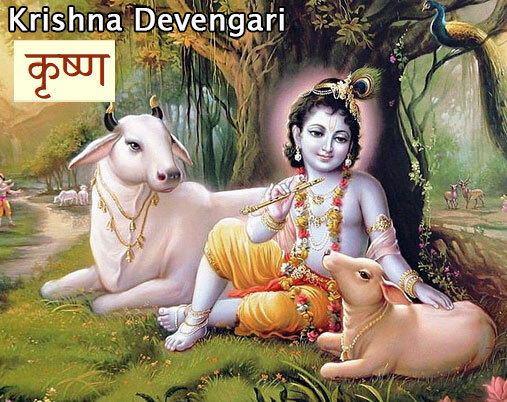 Teach how to write Krishna in Devanagari (show the correct direction and order for each line) and have everyone write the name in Devanagari script. The repetitive gesture involved in writing the name repeatedly is called Likhita Japa. The person writing the name must pronounce the name as they write it. Encourage people to keep a book with only Likhita Japa filling its pages. Do a kirtan to Krishna (or any other deity) where you sound the same name with many different inflections like: yearning, calling, commanding, imploring, angry, happy, sad, jealous, adoring, praising, reprimanding, celebrating, etc. Teach and chant the Sanskrit alphabet during the month. Start with vowels. In the same way that spoken words carry a deeper level of meaning in sound vibration, the asana has an outer form or shape and also a sound vibration or resonance through the shape that actually determines what is communicated. If we could combine the execution of the asana with the sound of a name of god then the result would articulate the divine essence. Become more aware of the sound of your own voice. Record your voice teaching a class and listen back while you follow along. Are the words flat and empty or are you making full use of the sounds available to you for good communication?